Apple iTunes store offers hundreds and thousands of videos and slideshows for you to purchase and download. You could purchase and download your favorite videos freely. Generally, these purhcased and downloaded videos are in .m4v extension, which could be played back on iTunes and QuickTime player. There are cases when you want to play M4V files on DVD player or HD TV. You then need to burn M4V to DVD disc. This tutorial will offer you detailed information on burning M4V to DVD on Mac and Windows. 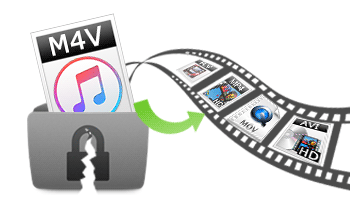 Designed by Apple and similar to the MP4 format, M4V file format is a video container format that is used to encode video files like TV episodes, movies and music videos in Apple’s iTunes Store. M4V files purchased and downloaded from iTunes Store are usually protected with Apple’s FairPlay DRM copy protection. To play a protected M4V file, the computer needs to be authorized (using iTunes) with the account that was used to purchase the video. However, unprotected M4V files may be recognized and played by other video players by changing the file extension from ".m4v" to ".mp4". Under QuickTime, M4V video with FairPlay attached to it is identified as AVC0 Media. Besides Apple iTunes and the Apple QuickTime Player, M4V files can also be opened and played with Media Player Classic, K-Multimedia Player, RealPlayer, Zoom Player, VLC media player, Free Blu-ray Player, MPlayer, DivX Plus Player, and Nero Showtime (included with Nero Multimedia Suite). To convert M4V to DVD on Mac or Windows, you need firstly make sure whether your M4V files are DRM protected or not. If M4V files are protected, you have to remove the protection beforehand. Removing DRM protection might not be allowed in some places. However, it is supposted that everyone should have the right to remove DRM protection of purchased iTunes M4V videos for personal use. To remove DRM protection of M4V files, there are a lot of DRM removal tools to make use of, such as Tuneskit, Video Converter, etc. "How can i convert m4v to dvd? – I have some m4v video files i want to play on dvds how to convert m4v to dvd disc for playback on dvd players. I am using windows vista." "I recently downloaded a movie through iTunes which came in M4V format. My DVD player does not support this format which means that I can’t watch it on TV but only on my laptop. I have tried to convert M4V to DVD format but am not able to do this because of iTunes security on the download. What should I do next??? Please help!! Windows 7"
You could get so many examples and answers once you search "how to burn m4v to dvd" on Google. Tens of M4V to DVD converter programs are suggested. No matter which M4V to DVD converter you take, the very first thing you need to do is remove DRM protection of M4V files (you could use the apps mentioned above to do this). Then you could use Leawo DVD Creator to convert and burn M4V to DVD on Mac or Windows freely. Leawo DVD Creator is one of the best DVD authoring software programs that could convert and burn video of up to 180+ formats to DVD content and burn ISO files to DVD disc directly. 1. Convert and burn any video (up to 180 formats like M4V, MP4, AVI, FLV, etc.) to DVD disc, folder and/or ISO image file. 2. Edit source M4V files like adding signature, changing video effect, rotating videos, adding 3D effect, etc. 3. Add disc menu and edit disc menu by adding background music/image/video, changing title position, text color, font, etc. .
4. Plenty of disc burning settings like TV standard, burning to folder/ISO/disc, burning engine, etc. Blank writable DVD disc (in case you want to burn M4V to DVD disc for directly playback on DVD players). Computer with DVD recorder drive (to insert DVD disc and write content onto DVD disc). Source M4V files (without DRM protection). Get source M4V files ready and then launch Leawo DVD Creator. On this M4V to DVD burner, click the "Add Video" button to browse and add M4V files. Note: Set output disc type (according to the disc you’ve inserted into the drive), aspect ratio and frame rate at the bottom. You could play back and edit loaded M4V files after loading. On the right sidebar, you could select a disc menu template for adding to the final DVD file. Clicking the middle of the template leads you to previewing selected menu. You could even edit disc menu by clicking the pencil icon on the preview panel, like adding background music/video/image, title and text editing, etc. Click the big green "Burn" button, and then set "Burn to", "Disc Label" and "Save to" options on the popup sidebar. To set DVD video mode, click the wheel icon on the top-right corner and then select “Burn” tab. You could select from NTSC and PAL (NTSC TV mode is used in the United States of American and Canada, while PAL is used in Australia, part of Asia, and some European countries). 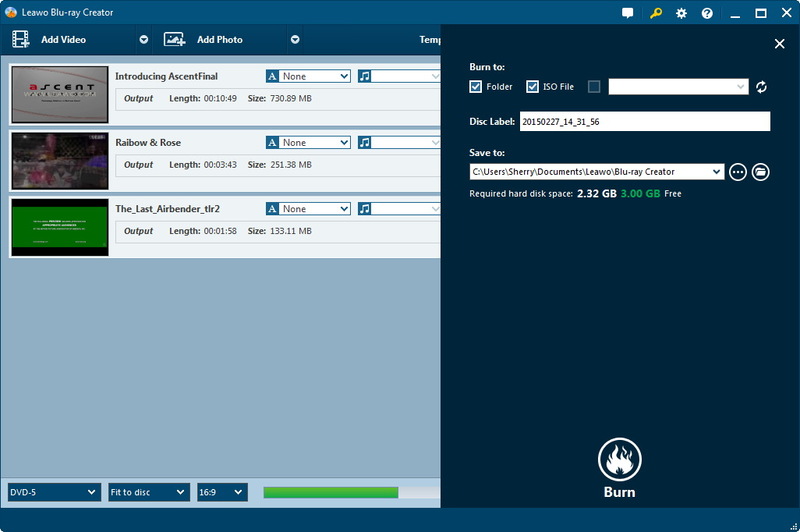 Insert DVD disc into DVD recorder drive, set output DVD disc type at the bottom of the main interface, and then choose DVD recorder drive as target under "Burn to" option if you want to burn M4V to DVD disc. The "Burn to" option allows multiple choices. After settings, click the bottom "Burn" button to start converting M4V to DVD disc within Leawo DVD Creator. With the tips above you now know how to burn DRM M4V to DVD, but there’s another kind of video on iTunes that you can’t normally get access to unless you pay for it. Rental and purchased videos are usually protected by DRM and can only be played with iTunes. But there are programs designed to convert the rental and purchased iTunes movies to normal video file for video playback with other video players or on other devices. So if you want to play your rental movies on iTunes, the program below is what you are looking for. Leawo TunesCopy is a program designed for converting rental and purchased iTunes movies into regular MP4 files. 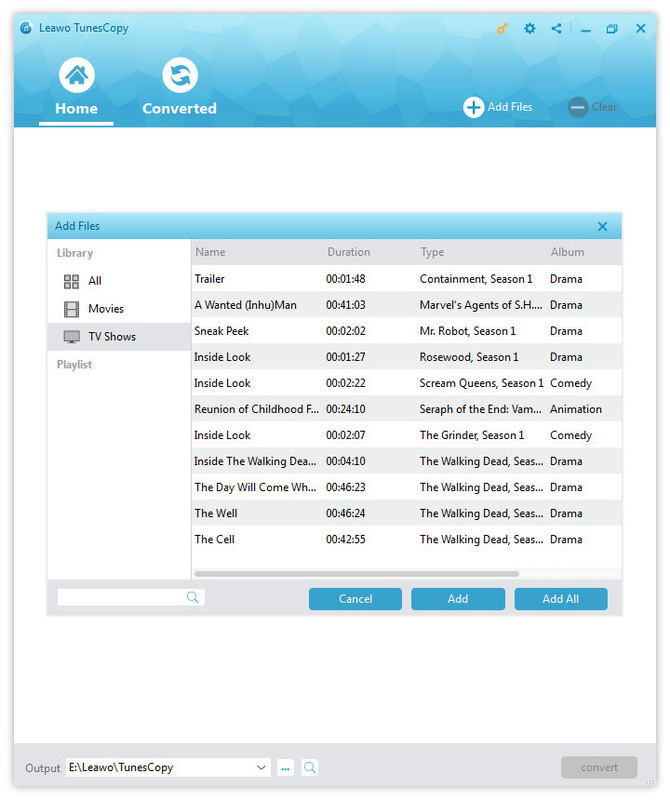 With it you can easily convert movies or videos in iTunes Store or TV shows that you purchase or rent into MP4 and burn it to DVD. Check out the instructions below to see how to use Leawo TunesCopy to convert and burn rental and purchased DRM M4V to DVD. Run TunesCopy. The first thing to do is to add M4V video to the program, click “Add Files” button on the sub-menu bar or “Add Files” button in the middle of the interface and the program would automatically scan all the rental or purchased M4V videos on your computer and present them to you on the following pop-up window. Choose the video you want to convert and click “Add” button or import all the videos to the program at the same time by clicking “Add All“. 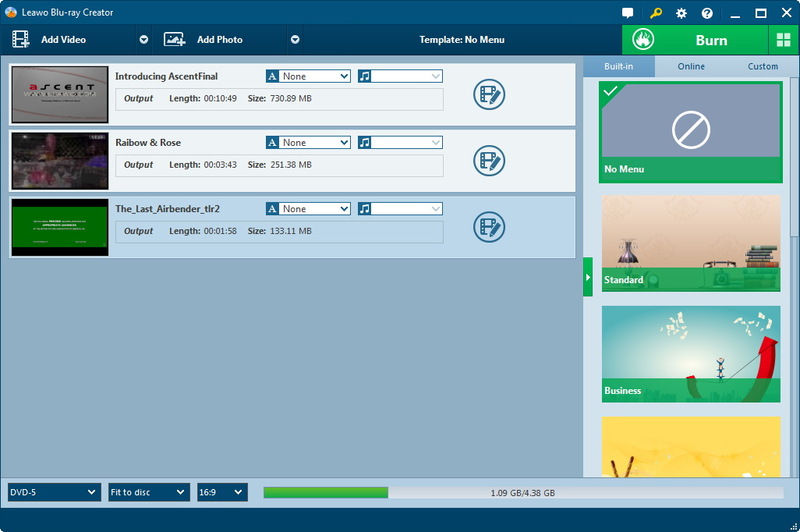 Some videos might contain multiple sets of audio tracks and subtitles. Click Edit button on every file to choose the audio tracks and subtitles you want to save to the output file. And you would see all the audio tracks and subtitles on the pop-up menu for you to choose. At the bottom of the interface you can see an “Output” option. Click the button next to the default output directory to select a new folder to save the output video. When you are done with the above steps, click the Convert button on the bottom right to start removing DRM protection from the M4V video and converting M4V to MP4 video. Before the conversion starts, you will be asked to authorize the computer to play the video you are converting if you haven’t authorized the computer before. Below is the video guide of Leawo TunesCopy for your reference. After reading the above content you should know how to burn DRM M4V video to DVD. It’s worthing noting that TunesCopy currently only supports Windows, but the Mac OS version should be out soon.